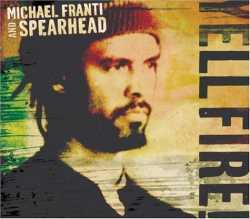 CD review Michael Franti and Spearhead - "Yell Fire!" Inspired by his recent trip to Israel, Iraq and the occupied Palestinian territories, the ever socially conscious Franti delivers the goods on this searing and passionate look at life during wartime. Much of the album was recorded in Jamaica with the incomparable rhythm section of Sly Dunbar on drums and Robbie Shakespeare on bass, so it's no surprise there's a reggae feel on much of the material. But there are strong rock and hip-hop influences as well. The title track is a rousing plea to end greed and materialism, set to irresistible, driving beats and arena-rock guitars that won't relent. And Franti has subtler, more reflective things to say on "I Know I'm Not Alone," where he admits to being confused about the state of the world and how to live a meaningful life. "Sweet Little Lies" is about how we willfully believe in fantasies in order to survive life's harsh realities. An unflagging sense of optimism is the message of the engaging "Hello Bonjour," "Hey Now Now " and the dance floor sensation "Everybody Ona Move," where he sings, "Music is love / Love for the masses / Love for all classes." Got a problem with that, bub?